It’s bound to happen. Stemware develops residue stains over time, not matter how well you wash. 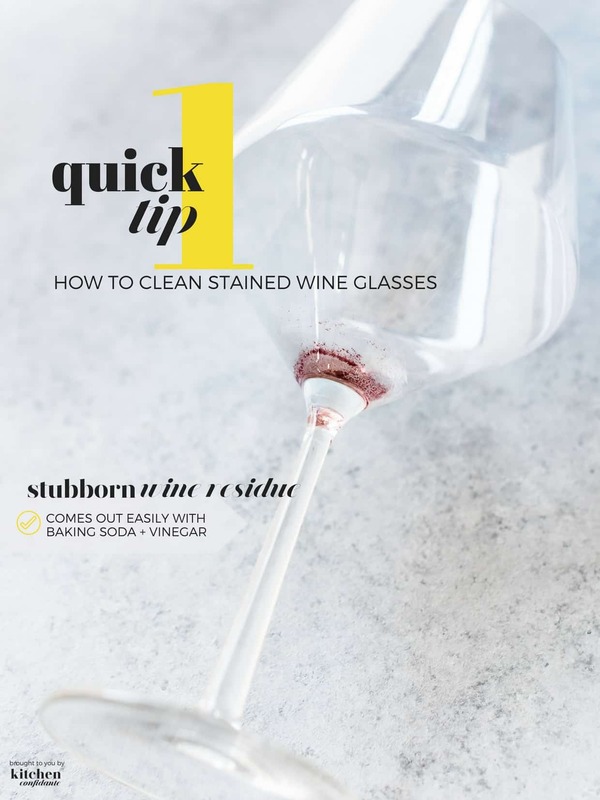 Learn how to clean stained wine glasses with One Quick Tip, including stubborn wine residue! You love a glass of red wine. You invest in beautiful, good quality wine glasses. Perhaps even a decanter or two. You try to take care of them by not letting wine sit overnight. Or maybe you do. 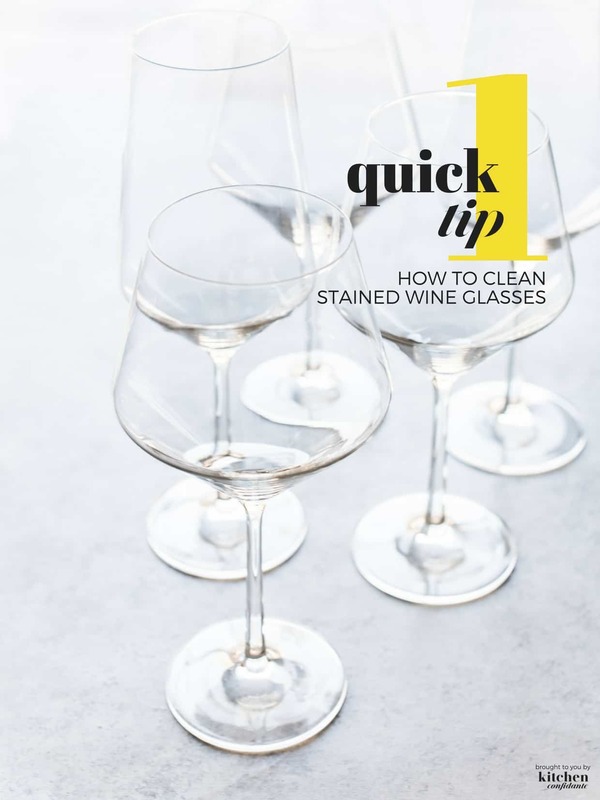 But no matter how hard you try — how carefully you wash — you find that over time, there’s that stubborn wine residue stain at the bottom of the wine bowl that just won’t go away. Don’t worry, we’ve been there. 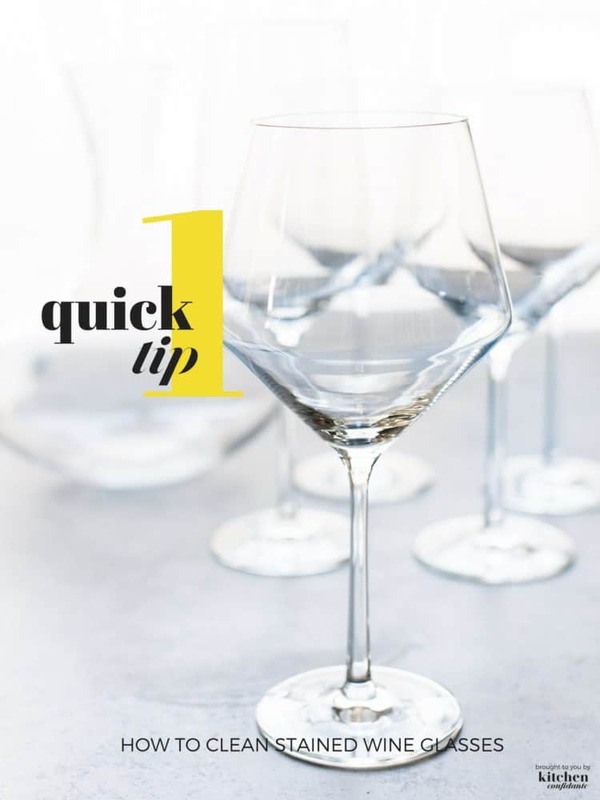 And I have One Quick Tip to help you easily clean those wine glasses so that they look crystal clear and brand new! 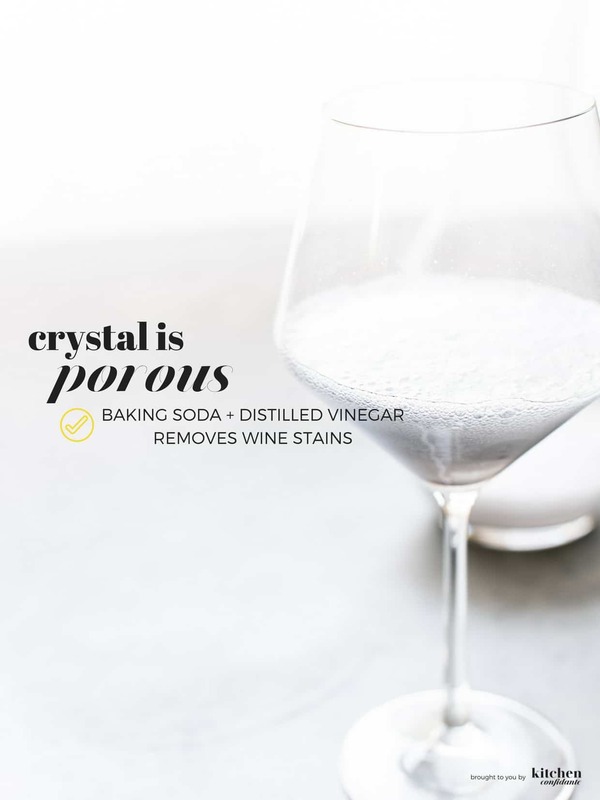 Higher quality wine glasses and crystal does make a difference when it comes to enjoying and enhancing the aroma and flavor of wine, but because it is more porous, it holds on to stubborn stains that are elusive to soap and water. But all you need for the most stubborn stains is some good ole’ baking soda and distilled vinegar. This household duo is good for so many things — and it’s no different when it comes to cleaning stained wine glasses. 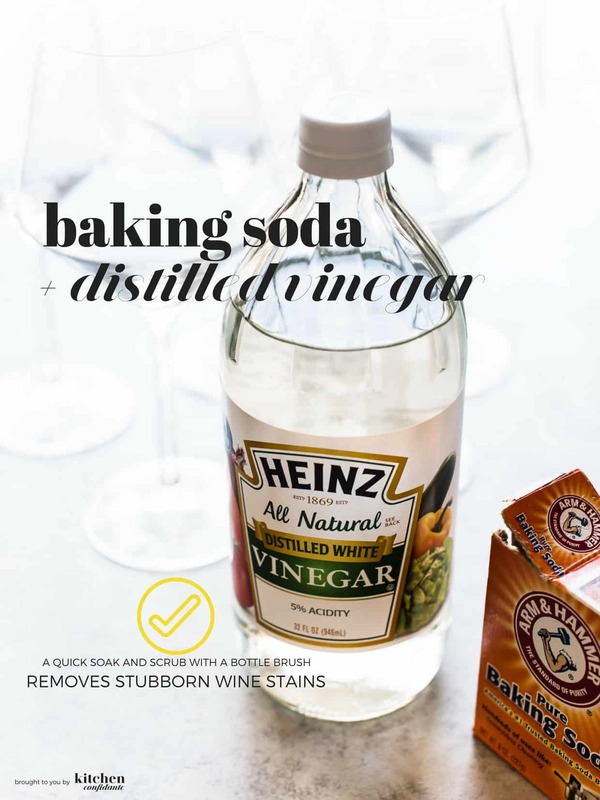 If your stains are not that bad, you can try just plain distilled vinegar, but the combination with baking soda works very well. Just let it bubble and soak for a couple of minutes, scrub gently with a bottle brush, rinse and dry! I hope this helps you with your stemware! 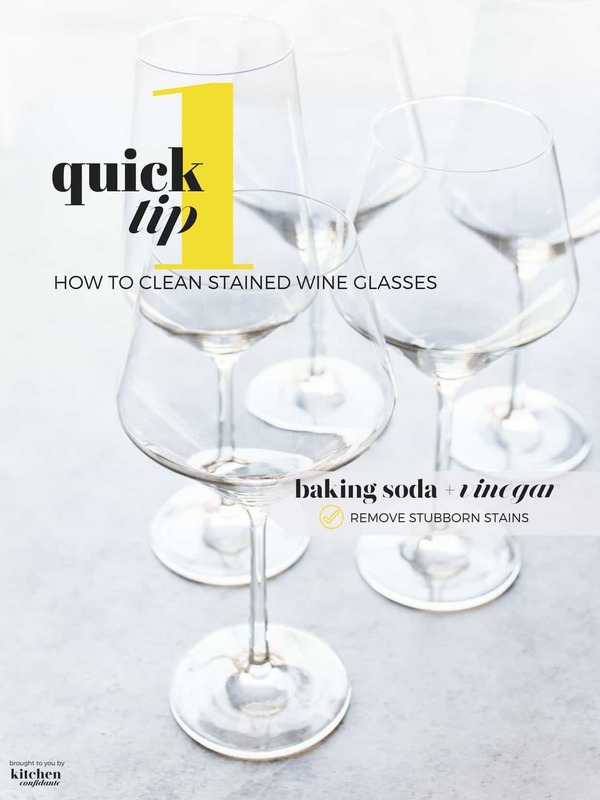 Do you have another way to clean wine glasses? Let me know in the comments below. Find more One Quick Tips here. Denture cleanser tablets work also. They are also great at getting stains out of any glass container such as vases. Ah, that’s brilliant! I’ll have to try that, too. Thanks, Sandy! will implement that for sure. You mean baking soda, right? Not baking powder? Hi Kimberli! Yes, good catch! I’m off to fix that typo, thank you!